Brett Keisel’s nose can tell when he’s in Wyoming. For the former Pittsburgh Steelers defensive end and Greybull alumnus, the place where he spent most of his childhood and started on his path to the NFL carries a distinct scent. ‘Those boys’ would eventually be Keisel’s teammates for four years at Greybull. But before they helped the Buffaloes to one of the best seasons in school history, they were just young kids playing every sport imaginable whenever they had time. In 1996, 11 seniors went out for football at Greybull, something Keisel notes as his favorite memory. Greybull went 7-2 that year, losing to Lusk in the 1A-Division 1 semifinals. It was the first time the Buffaloes made the semifinals since 1989. Michael McGuire, who played quarterback for Greybull and is now the head football coach at Big Horn, recalled one play Keisel made in high school after a significant hand injury forced him to wear a large cast. But more than his healthy statistics and numerous accolades, Keisel is remembered by teammates for the intangibles and off-field attributes he showcased. 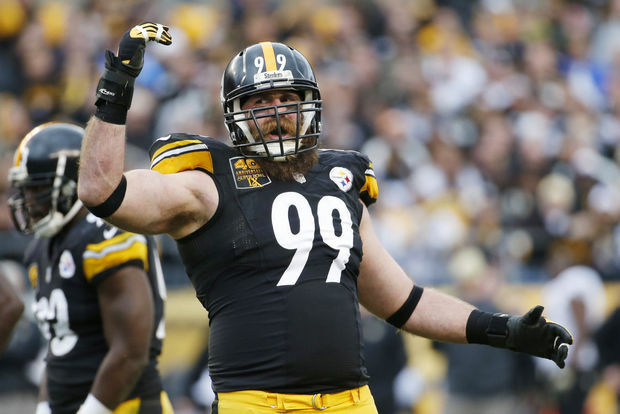 After Greybull, Keisel played at BYU — with a brief stint at Snow College — before being drafted by the Steelers in the seventh round of the 2002 NFL Draft. As Keisel’s career — and beard — gained notoriety with Super Bowl titles in 2006 and 2009 along with a Pro Bowl selection in 2010, Hunt was able to see Keisel play several times in Pittsburgh and Denver. Almost 20 years since their Greybull careers ended, McGuire and Hunt both said Keisel hasn’t changed a bit. Earlier this month, Keisel traveled to Canton, Ohio, for former Steelers running back Jerome Bettis’ Hall of Fame induction. He compared it a family reunion, seeing people who were not only teammates, but friends. And the same can be said for any time those boys from Greybull get together. Thank you to WyoVarsity, Casper Star-Tribune for the great article! « The Bus gets his Bust!